Two RDG team members are offering workshops at this year’s NOFA-NJ Winter Conference. 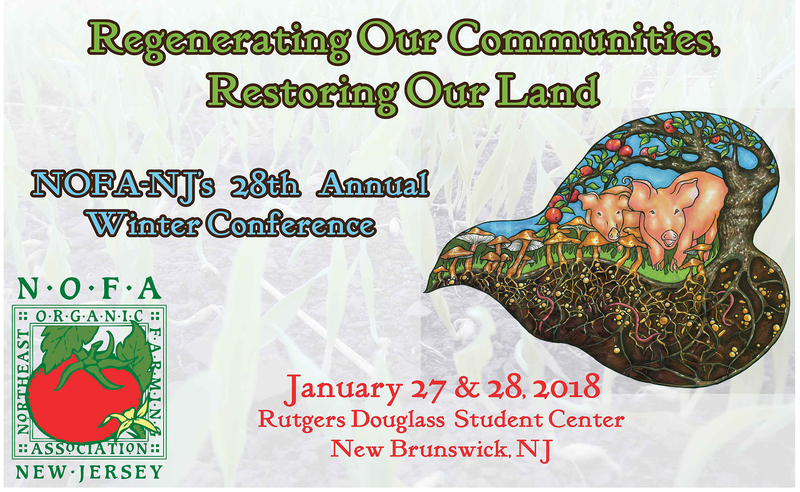 The two-day conference (January 27th & 28th) focuses on community regeneration and land restoration and is packed with speakers and workshops focused on soil health, regenerative agriculture, urban homesteading, animal husbandry, and more. Rachel Lindsay’s workshop is Integrated Design: Cultivating Food, Clean Water, and Community in Urban Farms. She’ll provide an overview of urban farm design—covering goals development, site assessment, and design elements—using case studies from around New England. Jono Neiger will offer Productive Conservation: Generating Yields from Farm and Homestead Buffers. He’ll introduce the concept of productive conservation as the integration of productive plants into different types of buffer strips; planning and business approaches, recommended plants, and management practices will be covered. Rachel and Jono have both done quite a bit of client work in New Jersey over the past year, on master plans for a family farm and a therapeutic horse riding center. They’re excited to be able to offer workshops at this year’s conference and make more connections with all the good work happening there.